Supply and return products for T-Bar ceilings are an innovative response to the challenge of creating a better indoor environment. T-Bar products combine clean appearance with installation ease, and include critical design details to ensure consistent performance. 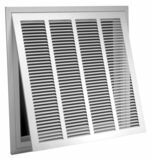 T-Bar products are offered in lanced, perforated, louvered and fixed-bar face styles, with steel or molded fiberglass backs. They include a choice of easy mounting systems and adjustable damper designs.